This is a continuation of a Travel Series of my vacation to Myrtle Beach. To start at the beginning go HERE. The rest of the posts,, in chronological order are HERE, HERE and HERE. Whenever my husband and I take a vacation there is always one place that is the highlight of our trip, and for our vacation to Myrtle Beach, it was Brookgreen Gardens. Brookgreen Gardens is a 9,100 acre wildlife preserve that contains gardens, a low-country zoo, art museums, and historical/cultural educational trails all wrapped up in one magical place. There is so much to see and do at Brookgreen Gardens that when you buy your ticket it's good for six days! We only had one day to spend at Brookgreen but we managed to cover just about everything but the children's play area, the butterfly house, and the two indoor art museums. But boy, we were exhausted when we were done! Although there is a free shuttle service to take you to all the main attractions, there is still a lot of walking involved. When we first arrived at Brookgreen Gardens we immediately went to the Visitor Center where we watched a short movie to learn more about the history of this magical place. The park today is a compilation of four old rice fields. It was purchased by the Huntington's (remember when I talked all about them in my travel post of Huntington Beach State Park?) originally to showcase Anna's sculptures, but later donated and opened to the public in 1932. After seeing the movie at the visitor center we then took a pontoon ride to see the old rice fields. The hour long boat ride costs an additional $8.00 but it is a must-do-activity if you visit the park for the guide gives you a lot more history of the park than you see in the movie. The boat tour takes you through the unique landscape of the rice fields where you can see alligators (If your lucky! 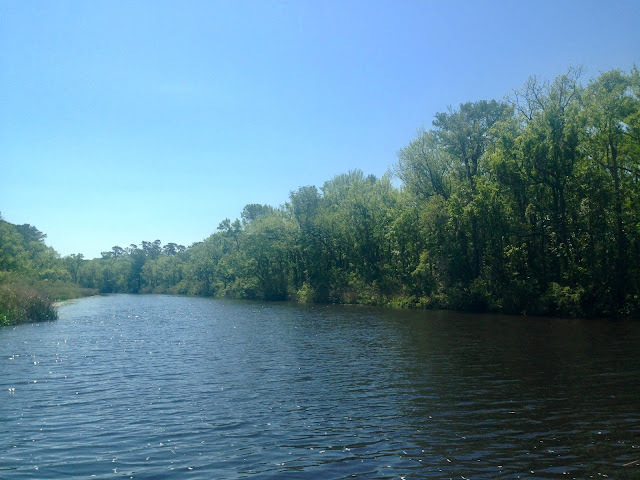 We were, and we got to see a big gator sunning himself on the river bank ) and waterfowl while a guide tells you how the rice fields worked and also the hard lives of the slaves who worked in these fields. After the boat tour, we headed for the Low-Country Zoo where they have animals that were used on the plantations hundreds of years ago and also animals native to the low-country. Horses and oxen were animals used on the plantations. My favorite area of the zoo was the bird area. I loved it because they had these huge outdoor areas enclosed with a high net that visitors could walk inside of but the birds could not get out. The net was practically invisible, so it was a fabulous way to get a close up view of birds that might otherwise fly away in nature. The majority of the animal displays were very natural, like this otter viewing area. Because it was a natural river, it was harder to spot the otter...do you see her in the top center of the river water? Alligators are plentiful in South Carolina so of course this zoo had one! Can you believe the size of him? I loved the pretty foxes up in the trees. I never knew foxes could climb trees and enjoyed sleeping on the limbs. After the zoo we went back to our car and had a picnic lunch. There are several cafeterias in the park, but the food can be costly, so we brought our own lunch. However, the park does appreciate you purchasing food from them as it helps offset the costs of maintaining the park. Once we were finished with lunch, we then headed over to the gardens. We were probably at the gardens during the worst time of the day as the lighting was so intense I couldn't get good photographs. It was recommended to me to take the boat ride first because tickets sell out fast plus understanding the history of the park would help us appreciate the rest of the park more. But doing the boat ride first, meant being in the flower gardens when the sun was at the highest point. This is the entrance to the gardens just outside the Visitor's Center. Now I have been to many botanical and public gardens in my lifetime but I have to say Brookgreen Gardens is the best gardens I have ever seen. Every corner, every landscape, was a breath-taking sight. I think I screamed with delight every time I rounded a corner and "oohed" and "ahh'd" at every gorgeous fountain, flower bed, or sculpture. What makes Brookgreen Gardens so different from any other gardens I have ever visited is the sculpture, architecture, and water features. Yes, every gardens has these, but not to this extent. The sculptures range from small statues of garden squirrels to massive horses or Greek Gods. In addition to sculptures there are more water features, ponds, and small lakes than I could count. And all of this is surrounded by gorgeous tall oak trees or magnificent tall palms. There is also so much architectural interest in this garden from brick walls and stone arches to wisteria covered pergolas. The Palmetto Garden was one of my favorite spots. This garden is surrounded by a brick wall. Inside the brick wall is a beautiful pool of water with a large sculpture and two water fountains. Surrounding the pool of water were gorgeous foxgloves and planted all around the perimeter of this garden are tall, magnificent palmetto trees. Every path led to another gorgeous garden with more amazing sculptures and water features. I said to my husband "If nothing in this garden were in bloom, it would still be beautiful just because of all the architecture, water features, and sculptures.". This sculpture is "The Fountain of the Muses". Like the Palmetto Garden, it was surrounded by blooming foxgloves. I also loved the wisteria covered pergolas on either side of the water feature. This sculpture of Pegasus was so large it could be seen from quite a distance away. The picture does not show it's true scale. What you also can't see in the picture is the amazing countryside vista behind it. So many of the gardens took into consideration the beauty of the countryside in the distance. This is the "Old Kitchen". There are three places to dine in Brookgreen Gardens: The Pavilion, which offers a full service menu, The Courtyard Cafe for snacks, sandwiches, and drinks, and The Old Kitchen if you need a quick pick me up of a dessert or beverage. The only one I went to was this one, where I purchased a peach ice tea. Even if your not thirsty or hungry, it's worth stepping inside this cute old building which once was used as a kitchen many years ago. In addition to all the grandiose gardens in Brookgreen, they did not forget the children and they created a lovely children's garden. There were so many cute nooks and crannies in this garden to explore from tee pees made of old branches to walk under to sculptures of funny looking swine. I felt like a small child myself exploring this cute children's garden. This is the Brown Sculpture Court. It is a beautiful stone structure with a pool in the center surrounded by sculptures all around. At the far end of this structure is an indoor art museum (The Bleifield Gallery). There are two indoor sculpture museums (the other one is called The Offner Sculpture Center) we did not explore either of the indoor museums thoroughly for lack of time, but if you need to cool off from the hot South Carolina sun, they are both air-conditioned! The Offner Sculpture Center in particular has a video loop showing how some of the sculptures are made which is quite fascinating. This is the main sculpture and water feature in The Poetry Garden. It had a lovely Mediterranean style to me. I should also point out that there are free garden guided tours you can take if you want to learn more details of the sculptures or plants. We did not take any tour other than the Pontoon Boat tour, but we saw lots of people enjoying them. We did eavesdrop a bit to hear all about the history of the oak trees in "Live Oak Allee". There is also a couple of tours that require an additional cost as well. So if you visit Brookgreen Gardens and are interested in the tours, be sure to stop at the Visitor Center first to get times and/or tickets. This gorgeous staircase leads to "The Trail Behind The Garden Wall". In addition to everything else there is to do and see at Brookside, there are also hiking trails. Are you beginning to understand why your ticket is good for six days? There is so much to do here! We did not hike this trail because walking the main attractions was more than enough walking for us. We could also see portions of it from our pontoon boat tour. This lovely area had roses, large red hibiscus (I've never seen hibiscus growing in the ground before. In my neck of the woods we only grow it in a pot at Christmas time), and gorgeous cat mint. Of course I had to sit on a bench and enjoy it all for awhile. "Live Oak Allee" was another one of our favorite spots in Brookgreen Gardens. It is absolutely breathtaking! It is a long path with huge, magnificent old oak trees on either side that are estimated to be over 300 years old. I remarked to my husband as we walked under these large branches dripping with Spanish moss "Oh, if only these trees could talk, the stories they could tell!" One of the trails we did hike was The Lowcountry Trail. This is an educational trail where you learn about the lives of the slaves who worked on the rice plantation. The trails crosses a hillside overlooking a restored rice field and there are also archaeological digs showing the remains of four structures. At each stop you can read about the slaves life and also press a button for an audio tour. This is an old cypress tree log. It's left fallen as an example of the size of trees the slaves had to cut by hand when clearing a field for a rice plantation. Brookgreen Gardens is not just for adults, there is so much for children to see and do as well. 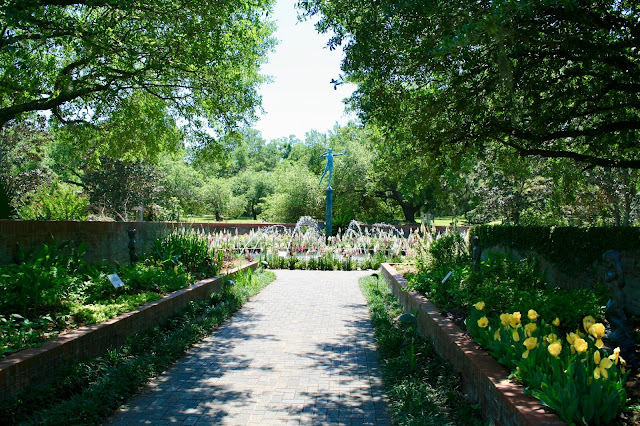 In addition to the zoo, they have a Children's Nature and Sensory Trail, an Enchanted Storybook Forest, a Discovery Room, a Butterfly House and other programs and exhibits. Because my husband and I don't have any small children, we didn't do any of those things but I did see some of them as I walked by and they looked pretty cute and fun. 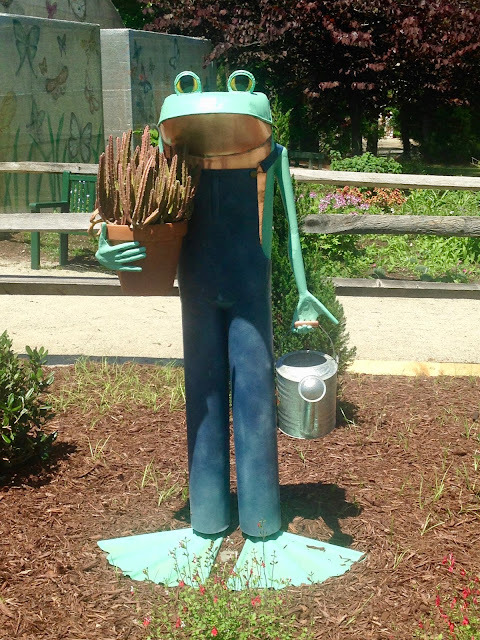 I did take a quick spin around the "Ribbit the Exhibit" because I thought all the frog garden statues were so cute! The park is open daily from 9:30 a.m. to 5:00 p.m. We arrived when the gates opened (I would advise getting there early as it seemed the parking lot filled up fast) and we were one of the last people to leave. If my body were more willing, I would have explored more, but by the end of the day I was beat! On our way back to our car we saw more lovely sights like this beautiful pond and sculpture. And we thought this sighting of a row of turtles basking in the sun all in a row on a log was just too cute! Brookgreen Gardens truly is a site not to be missed if you're ever in the Myrtle Beach area! It was definitely our favorite day of our vacation. It is located 18 miles north of Myrtle Beach right off of HWY 17. The cost is $16.00 for an adult and $8.00 for children 4 through 12 (there are additional fees for some attractions/tours). We always love to take the tours when we go places---it seems like you learn so much more!! What a great day, Amy!! Thanks Jodie! We don't usually take the tours because of the additional expense, but some times we do if we think it's important or worth it. What an amazing garden, loving these pictures! I am so curious now to see what will bloom when we are there in July. Good to know there are some air conditioned places around, we might need them then! I was wondering about the blooms myself, because what made most of the gardens so spectacular was the foxgloves. Is it possible they dig them up and replace them with something else? I don't know, but I'm curious to find out! I do love walking through a beautiful garden and this one looks spectacular! Thanks for sharing. Cute pic of you peeping out of the house made of branches! Thanks Nikki! I love children's gardens. I may have to design one for my grandchildren someday.